This well designed pouch from Cygnett boasts a variety of features from its distributor but in our opinion, the Cygnett Boston iPhone 4 Pouch is more suited to the business man as opposed to the traveller, labourer or sportsperson because of its design. For me, I want total protection of my iPhone 4 plus easy access to all its features and unfortunately the Boston does not offer all that. 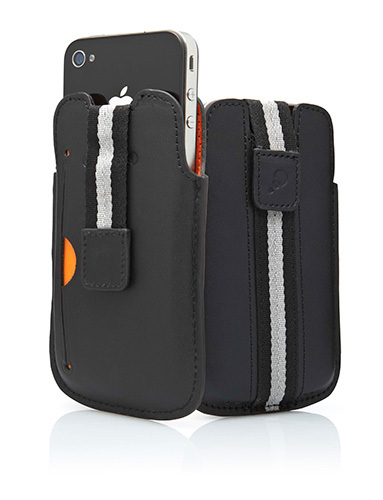 With that said, the Boston comes in two colours, black and dark brow and is a velvet-lined leather pouch which snugly fits your iPhone 4 and best of all, it protects your smart phone from all sorts of bumps, scratches and knocks. Provided it doesn't fall on one of the top sides. Unlike most cases, the Boston is considerably larger than most but ironically, accessing your iPhone 4 is actually quite easy thanks to the strap system that holds your phone in place. By releasing the strap, you have quick access to your iPhone 4 and if you think your smart phone will fall out, that's not really possible due to the magnetic fastener. Another benefit of the Boston is that is also comes with a screen protector that is basically a thin layer of plastic which protects your iPhone 4 from scratches and marks. The installation process of the Boston is quite simple. Your iPhone slides into the pouch and then you strap it in but the most difficult aspect is installing the screen protector. In my opinion Cygnett screen protectors are far superior than most on the market because they don't smudge as bad or show finger prints. If the screen does become a little messy, a microfiber cleaning cloth is also included. Given all this, the Boston is an interesting case but as you don't have full access to your iPhone, it does become a little fiddle some to say the least. Definitely for Mr. or Mrs. Style as opposed to accessible.